The Fire Station serving the United States Military Academy, West Point, NY is located at Building 721 on the main campus. The Fire Station is presently occupied by two Engine Companies and one Ladder Company. Building 721 was originally constructed in 1938 and subsequently renovated and expanded in 1984, which relieved some of the congestion problems experienced in the original facility. However, the building imposes severe limitations on the efficient operations and management of a modern three-company facility. To that end, EI in association with Iffland Kavanagh Waterbury, P.C. 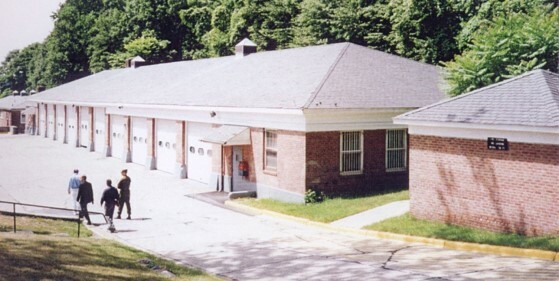 was authorized to study the feasibility of renovating a portion of Building 670 to accommodate a satellite fire station housing one Engine Company. This study developed the objectives of the Fire Department and indicated through these objectives that the renovation of Building 670 may be achieved by constructing a full height demising wall between the Engineering Platoon area and the proposed Fire Satellite Station along the column line connecting columns 16 and 17 and designating the 6 structural bays to the north of this demising wall as the area to be occupied by the Fire Department with the remaining area south of the demising wall occupied by the Engineering Platoon. This Fire Department area will then be gutted and reconstructed, including utilities, to accommodate the Fire Department program requirements. Conceptual plans have been developed and work items outlined, defining the full scope of the renovation and are presented in sufficient detail so that the Fire Department would have a basis to enable the postponement of certain work items should budgetary restraint become an overwhelming consideration.